Golshifteh Farahani in PATERSON. Credit: Mary Cybulski / Amazon Studios & Bleecker Street. Golshifteh Farahani as Laura delivers a bright performance and helps to shape Jim Jarmusch`s Paterson in such insightful way. 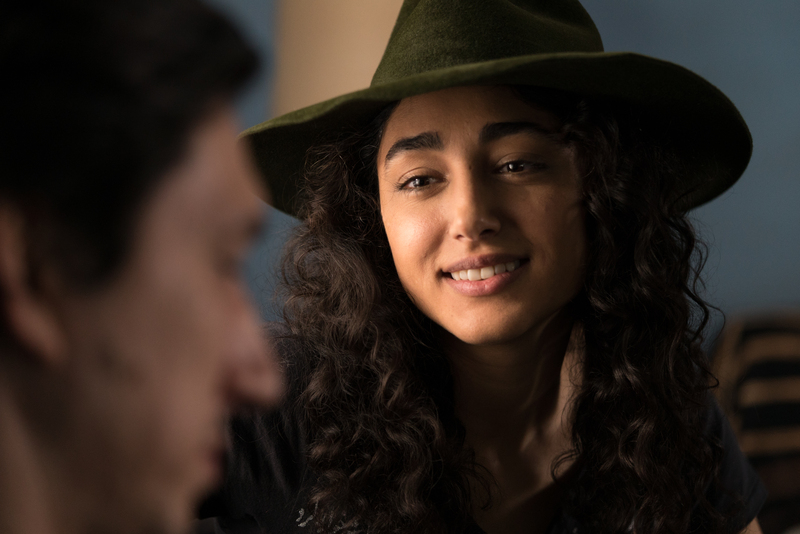 Last year to promote her movie during the Toronto International Film Festival, I had a please to sat down with Golshifteh Farahani to discuss Laura, Jim Jarmusch and Adam Driver. MOVIEMOVESME: Can you talk about your character, Laura, and the reason you decided to portray her? Golshifteh Farahani: Laura, in some ways, looks like me a little bit. I would love to be like Laura. I think she’s a great human being living in the present moment, being creative. Things that we are losing in time like telephone and some useless stuff in our head from what the society is trying to inject into us; Laura is not getting affected by that. She’s in a hole trying to create her own hole in her bubble of creation which is such an amazing thing. I think it’s a beautiful character. I didn’t even think about Laura as much because there was Jim! MOVIEMOVESME: What does the cooperation with Jim Jarmusch mean to you? Golshifteh Farahani: I think 99% of all actors want to be in his movies. He’s like Scorsese or Woody Allen or the other generation of directors everybody wants to work with; it’s like a dream. For me working with him was like wink when the God winks at you. When he contacted me, I couldn’t believe it; I was twelve when I saw his movie and made him my idol when I was working in music. Even at that time his cinema was the cinema I liked. For me it was one of the biggest gift I received in life working with him and knowing him as a friend. MOVIEMOVESME: What was it working alongside Adam and the kind of chemistry between you two? Golshifteh Farahani: I think the base of this relation is how couples who have mutual admiration and respect for each other even if they are different from each other can live in harmony. It was amazing working with Adam and he did an amazing job listening and not just acting. We had great moments together and he’s a great actor and human being. MOVIEMOVESME: You’re a musician as well. So how difficult was it to not play the guitar? Golshifteh Farahani: It was very tricky that part because I couldn’t fake it that much that I couldn’t play or do it horribly. I’m happy that scene is there; we had so much fun shooting it. Even Adam’s reaction was so amazing, he was just like a flower blossoming when I was singing that song. It was great. MOVIEMOVESME: Which scene would you say describes Laura’s and Patterson’s relationship from your point of view? Golshifteh Farahani: It’s very difficult to say that, which is why I guess all the sleeping scenes are there where they sleep. Nothing is happening but they’re sticking to each other. After the notebook is gone, she’s just sitting there and he’s sitting on the couch while she is trying to comfort him. Laura is trying to be a little edgy but she’s not in a world where normal has become Donald Trump and then being crazy is okay if normal is like that. The scene where the notebook is gone, I think that scene. MOVIEMOVESME: As a young actress from your country how difficult was it to take a stand and not get affected by what people wanted to impose on you? Golshifteh Farahani: When you were there, there were certain things, certain problems but when I left it was difficult. Normally the Syrian people coming out of Syria think they’re now safe and that’s where the problem starts when you’re out there. Exit is exile and then you have to build a new life. I had to start from point zero in a culture I didn’t speak the language and in this western world where wherever you come from you have to be that and not come out of that bubble. In the beginning roles coming to me were terrorist parts, things I didn’t want to be and didn’t accept. Coming out of that and breaking that mentality was the most difficult thing. It happened to me miraculously because for the past two years I have been a French woman, a 20th century Spanish woman, Laura in New Jersey, the Indian woman in Rajasthan, a Lebanese. We’re actors, we are not where we’re from but chameleons. I broke that typecasting in European cinema but couldn’t in the States because it’s even more difficult. MOVIEMOVESME: Did you see it coming what would happen after the Caesar’s advertisement? Golshifteh Farahani: Caesar’s was a semi-naked and the next one I did was a full-naked one. Maybe I was angry about the Caesar one because all these problems on woman’s body is something we are still living with. Women are still weapons of war. In France, they have a problem of ISIS and they banned burqini on the beach. What is the problem? Why can’t they let women be? I remember I was crying when I was doing that asking, “what’s your problem guys?” Of course, it had a big impact both times and it was a scandal but it has broken every taboo. Now the road is open for others. I’ve been that way from the beginning of my life and I’ve always been shot. Some people are born to be that and why not! MOVIEMOVESME: What were the conversations you had with Jim and Adam regarding your character who seems to be the rock in the movie? MOVIEMOVESME: Have you ever considered moving to L.A.? Goldshifteh Farahani: In lovers left alive Jim said L.A. is like a zombie city. I’ve been there and lived there. I think the people in L.A. are waiting; you can be in L.A. and do nothing and five, ten, thirty years would pass and you won’t even realize it. So, L.A. can be a point of flying because of Hollywood but also be a graveyard for so many artists who are just waiting on hold. When I left Iran, I went o L.A. and I stayed there for a few months during the crisis of 2008 and everything was shut down. I realized it was not the place I can be in where consumerism and capitalism is so on top and presentation and representation and high heels and all that thing in the name of L.A. They have taken it to another level. I’m more of a Bohemian, barefoot. I’d rather go to Montague. L.A. is an amazing place but I prefer to make this bridge in another way. MOVIEMOVESME: Can you talk about the poetry in the movie? Golshifteh Farahani: It’s very funny because in our art department and Mark, our art designer, took me to the art department and I started painting the curtains because Mark wanted the house to have an essence of me and Iran also. There were two music from Iran. Our culture is a very poetic culture where people are born with poetry and they die with poetry. It’s funny that I got there because Jim wasn’t that familiar with Iranian poetry but I sent him from time to time something from Hafez. The Japanese say translating a poem doesn’t work. I’m happy we took something from Iran while Jim wanted Laura to have an American accent but I’m happy we took a drop of my poetry into Laura and Patterson.